HIV and Hepatitis C can be spread by sharing needles. Safe injection practices are important to keep you, and your partners safe. 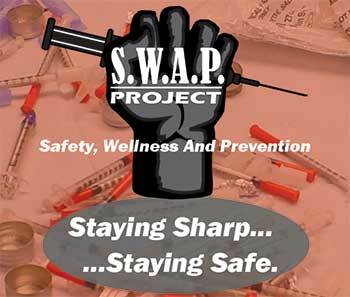 Our syringe exchange program offers clean works for injectors as well as education on how to inject safely, how to dispose of needles, and how to prevent and respond to an overdose. These services are confidential - just ask for Joe! Narcan (Naloxone) is an opioid antidote. This means Narcan can reverse/stop someone from overdosing on an opioid. Opioids are: heroin, opium, codeine, fentanyl, hydrocodone, and other prescription pain relievers. We offer free Narcan to anyone who requests it and goes through a brief training on how to use it. Call us for more information - (217) 531-5365Phone (217) 531-5365.